Create distinctive vector artwork for any project. 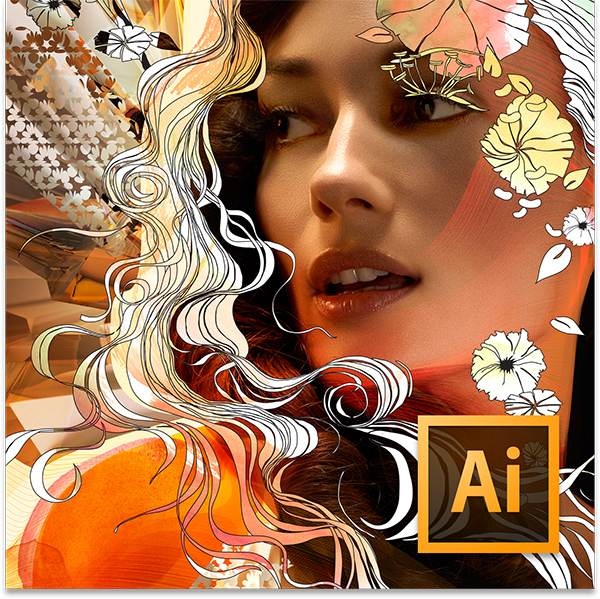 Used by design professionals worldwide, Adobe Illustrator CS5 software provides precision and power with sophisticated drawing tools, expressive natural brushes, a host of time-savers, and integration with Adobe CS Live online services. Adobe Illustrator offers you all the needed tools for creating and managing amazing vector art design! • Sophisticated vector drawing controls: Create distinctive designs with precise shape-building tools, fluid and painterly brushes, and advanced path controls. • Gradients and transparency: Interact with gradients directly on your objects and control the transparency of individual colors in gradients and gradient meshes. • Beautiful Strokes: Fully control variable-width strokes, arrowheads, dashes, and art brush scaling along a path. • In-panel appearance editing: Edit object characteristics directly in the Appearance panel, eliminating the need to open fill, stroke, or effects panels. • Integration with Adobe CS Review: Create and share online reviews for clients down the hall or around the world with Adobe CS Review, one of the new Adobe CS Live online services. • Industry-standard graphic file format support: Work with almost any type of graphic file including PDF, EPS, FXG, Photoshop (PSD), TIFF, GIF, JPEG, SWF, SVG, DWG, DXF, and more. • Adobe PDF file creation tools: Create more secure, multipage, graphic-rich PDF files with Illustrator layers retained. Share files confidently with service providers, including support for PDF/X standards. • Advanced typography: Design beautiful text for virtually any media with professional controls for paragraph and character styles, support for OpenType, transparent effects, and more. • Perspective Drawing: Use perspective grids to draw shapes and scenes in accurate 1-, 2- or 3-point linear perspective and create the look of realistic depth and distance. • Multiple artboard enhancements: Work on up to 100 artboards of varying sizes in one file named, organized, and viewed the way you want. • Drawing enhancements: Draw behind, disregarding stacking order. Draw or place an image inside, instantly creating a clipping mask. • Integration with other Adobe design applications: Share files smoothly with other Adobe professional design applications and easily create artwork for multiple uses. • Crisp graphics for web and mobile devices: Create vector objects precisely on the file's pixel grid for delivering pixel-aligned raster artwork. • Adobe Mercury Performance System: Work with precision, speed, and rock-solid stability on large, complex files thanks to a new performance system that powers Illustrator CS6. With native 64-bit support on Mac OS and Windows you can access all the RAM on your computer to easily open, save, and export large files and preview demanding designs. Just about everything feels faster and more responsive. • Pattern creation: Easily create seamlessly tiled vector patterns. Experiment freely with different types of repeating patterns that can be edited at any time for maximum design flexibility. • New Image Trace: Convert raster images to editable vectors with a completely new tracing engine. Get clean lines, accurate fitting, and reliable results without using complex controls. • New efficient, flexible interface: Take fewer steps to accomplish daily tasks in a new, streamlined interface. Enjoy inline editing of layer names, precise color sampling, and UI brightness that's smoothly adjustable to match other Adobe tools. • Gradients on strokes: Apply gradients to your strokes — along the length, across the width, or within the stroke itself — all with complete control over gradient placement and opacity. • Inline editing in panels: Efficiently edit names in layers, swatches, brushes, artboards, and other panels directly in the panels themselves without using intermediate dialog boxes. • Gaussian Blur enhancement: See that Gaussian Blur and effects such as Drop Shadows and Glows are applied significantly faster than before. To improve accuracy, preview directly on the artboard rather than in a dialog box. • Color panel enhancements: Sample colors faster and more precisely using an expandable color spectrum in the Color panel. And now, copy and paste hex values into other applications more quickly. • Transform panel enhancements: Quickly access the popular Scale Strokes and Effects option, thanks to its new availability in the Transform panel. • Type panel improvements: Use arrow keys to change fonts in context for selected text. Glyphs for caps, superscripts, and more can now be accessed in one place — from the Character panel. • Dockable hidden tools: Tear off and dock previously hidden tools, such as the Shape and Pen tools. Dock tools horizontally or vertically for a more efficient workspace. • Workspaces with rooms: Move fluidly from workspace to workspace with support for rooms. Achieve consistency across your work areas and maintain layout changes until you actively reset them. • Control panel enhancements: Quickly find what you need in a more efficient Control panel, now with consistency across options, anchor point controls, clipping masks, envelope distortions, and more.